MOUNTAIN VIEW, CA--(Marketwire - August 19, 2009) - eHealth, Inc. (NASDAQ: EHTH), parent company of eHealthInsurance (http://www.ehealthinsurance.com), today announced that it has entered into an agreement with the State of Utah to use eHealth's internet platform and technology to connect Utah residents to individual health insurance through the state's planned Utah Health Exchange located at http://www.exchange.utah.gov. The agreement provides for the state's online insurance exchange to link to a designated online portal from eHealth that will support the selection of, and enrollment in, private individual and family health insurance. The eHealth technology platform will be an online destination for residents to view a comprehensive selection of private individual and family health insurance plans in Utah and utilize consumer-friendly decision-support tools such as plan comparisons, physician choice, information resources and online applications and approvals. The agreement between the state of Utah and eHealth is an important step towards achieving the goals of Utah's House Bill 133 (HB133). HB133, the "Health System Reform" bill, which was signed into law on March 19, 2008, requires Utah's Governor's Office of Economic Development to develop an Internet resource that will increase access to quality health care for the state's estimated 2.73 million citizens. Under the agreement announced today, eHealth will provide an online individual health insurance capability that will allow Utah residents to find, compare and apply for private health insurance plans. Consumers in Utah will be able to access eHealth through the Utah Health Exchange, which is currently in the planning and development stages. 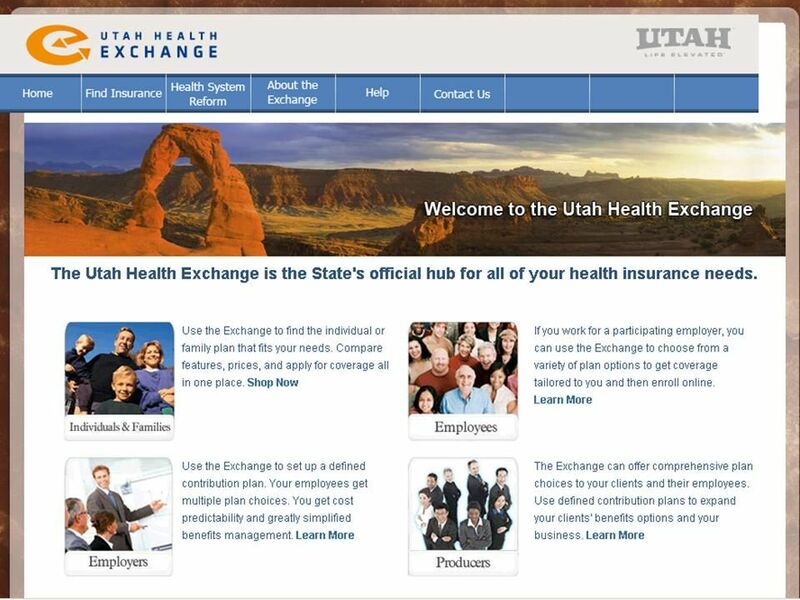 eHealth is licensed to sell health insurance in the state of Utah. eHealth's consumer web site, http://www.ehealthinsurance.com, currently offers Utah residents access to over 70 Health Insurance plans from leading companies like SelectHealth, Regence BlueCross BlueShield of Utah, Humana and Altius. "Connecting more Americans to health coverage is a national priority, but it must also be a collective effort," said Gary Lauer, eHealth President and CEO. "The State of Utah has taken a leadership role in health care reform by embracing innovative, consumer-driven technology to increase access to health care for the citizens of Utah. eHealth's proven platform makes us a natural partner for any state seeking to use the internet as a tool to increase access and efficiency in order to reduce the number of uninsured." This press release contains forward-looking statements as defined within the Private Securities Litigation Reform Act of 1995. These include statements regarding the development of the Utah Health Exchange, the launch of the eHealth technology platform and the effectiveness of the platform. These forward-looking statements are inherently subject to various risks and uncertainties that could cause actual results to differ materially from the statements made, including risks associated with delays in implementation of the Utah Health Exchange and the eHealth technology platform; the attractiveness of the Exchange and the platform; system failures, malfunctions, bugs or capacity constraints; the performance, reliability and availability of the Exchange, the platform and their underlying network infrastructure; ecommerce security risks; the success of the relationship between eHealth and the state of Utah; compliance with insurance and other laws and regulations and changes in laws and regulations. Other factors that could cause results to differ are described in eHealth's most recent periodic report as filed with the Securities and Exchange Commission and available on the investor relations page of eHealth's website at www.ehealthinsurance.com and on the Securities and Exchange Commission's website at www.sec.gov. eHealth does not undertake any obligation to update any forward-looking statement to conform the statement to actual results or changes in expectations.